This is a website for English students in 9B at Scoresby Secondary College. The site was created, and is moderated by, Mr Troy. From the start of Term 3 we will be studying John Boyne's novel The Boy in the Striped Pyjamas. We will make use of the information on this website in class, and you will also be able to access it in your own time at home. 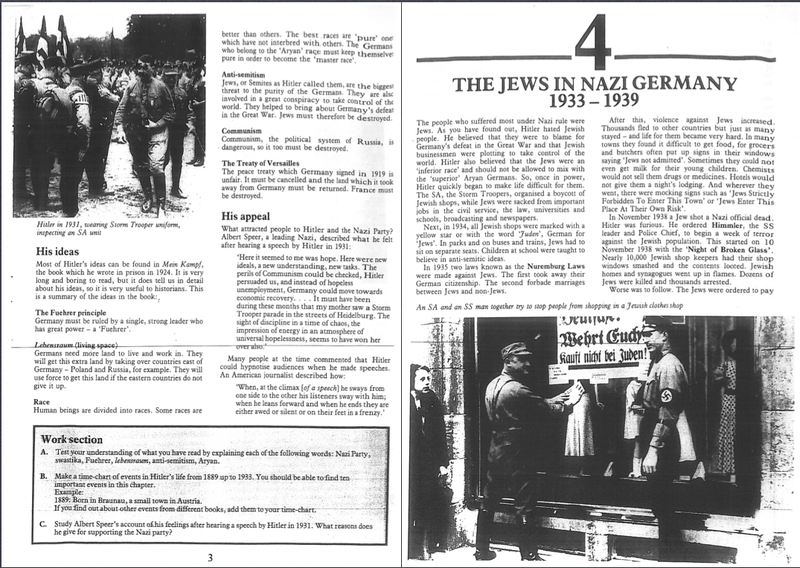 The above chronology provides a brief outline of some of the events that occurred during the Nazi regime in Germany during the early 20th Century. 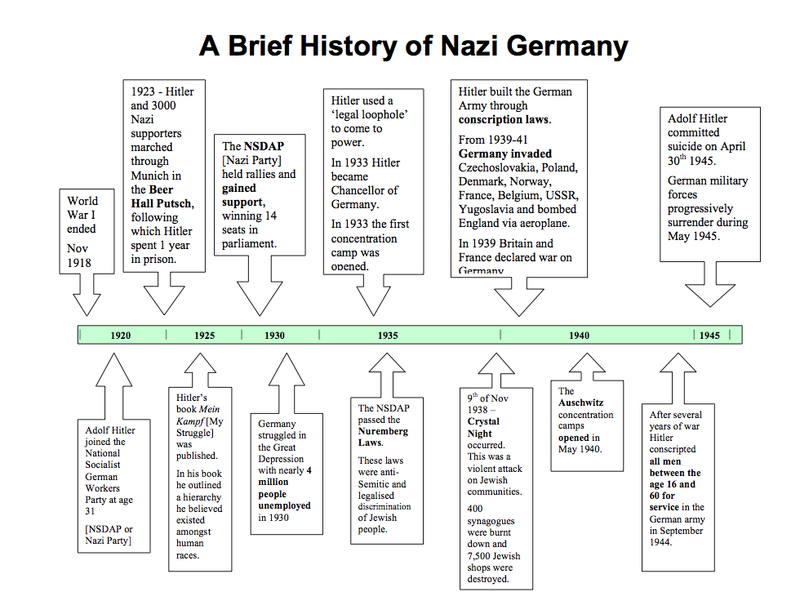 I have created this timeline to help you gain a broader understanding of the context of The Boy in the Striped Pyjamas. The above map highlights present-day Germany. 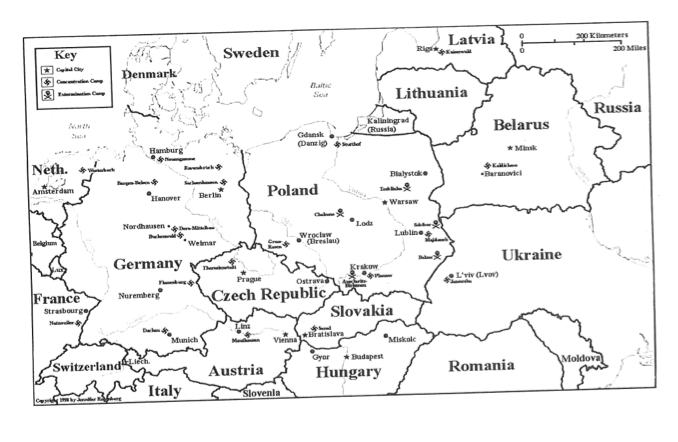 Nazi Germany (1933-1945) included many other territories such as Austria, the Czech Republic, Slovakia, Poland and more. 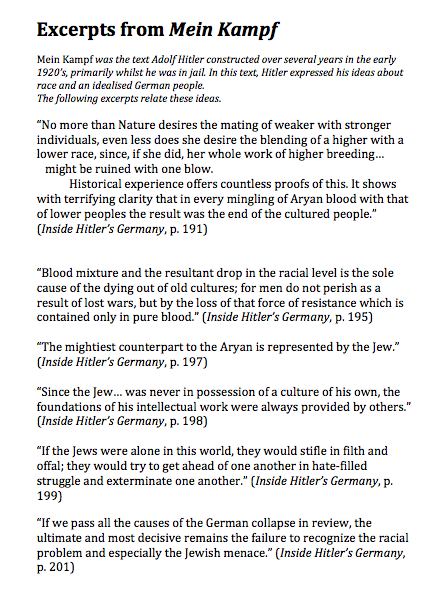 The excerpts from Hitler's autobiography below provide examples of the racist ideas he was expression during the 1920's, before the Nazi's came to power in Germany. Take not of the overtly anti-Semitic attitudes Hitler expresses. This film clip demonstrates the kind of propaganda that the Nazi's created in the 1930's to support their political regime. 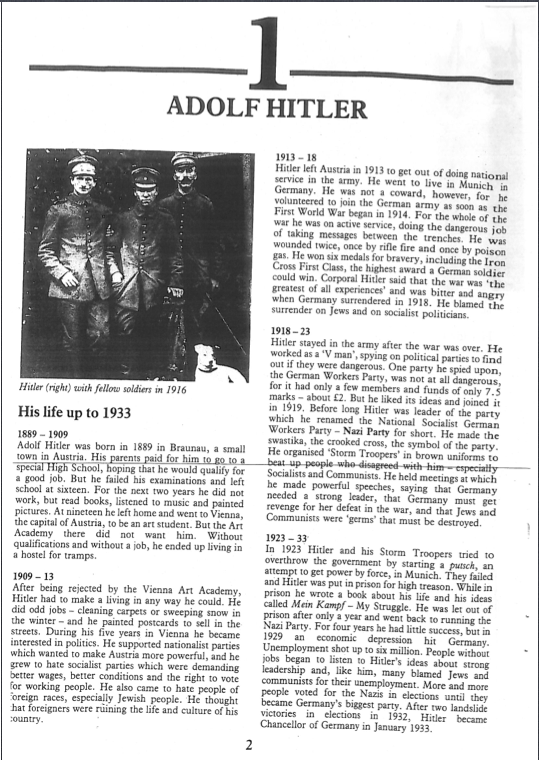 The film was made at the order of Hitler (the Fuhrer) in an effort to gain further popularity in Germany. It is accompanied by grand music and begin with Hitler descending through the clouds like a god, to crowds of cheering Germans. Adolf Hitler flew to Nuremberg to rally his followers"
The document to the left is is a copy of the 'Law for the Protection of German Blood and German Honor' as legislated in the city of Nuremberg, Germany on the 15th of September 1935. > Why would the NSDAP have legislated that Jews and German people could not marry one another? >What do Sections 2 and 3 infer? > What is the point of Section 5? 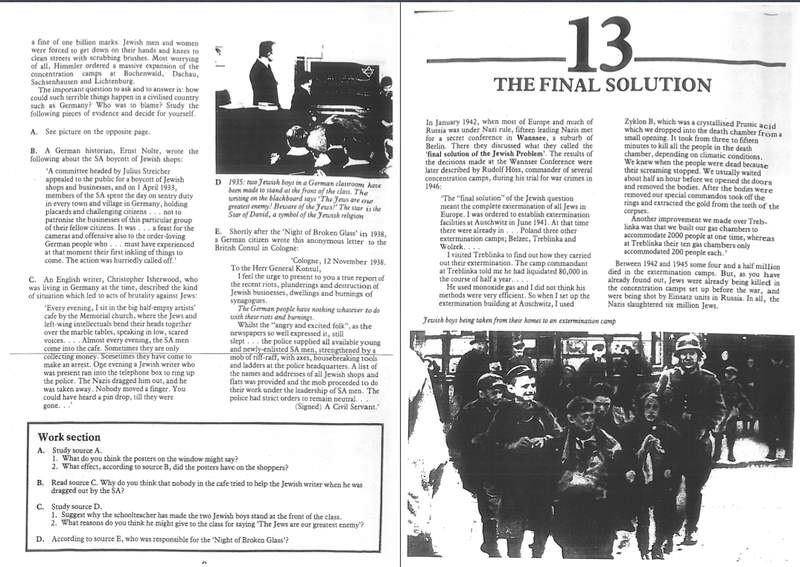 > What do you think the NSDAP hoped the Nuremberg Laws would achieve? Auschwitz was a network of concentration and extermination camps run by the Nazi SS (Schutzstaffel which translates into English as Protection Squadron). Certain groups of people, such as the Jews and the Romani, were sent to these camps where they either worked or were murdered in gas chambers. Auschwitz had 3 major camps (Auschwitz I, Auschwitz II-Birkenau and Auschwitz III-Monowitz), as well as 45 other satellite camps. 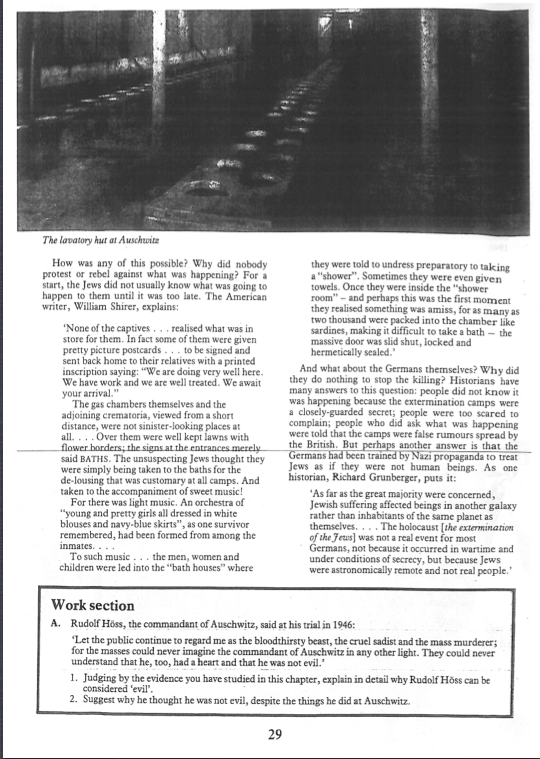 This 10 minute clip provides general information about the structure and function of Auschwitz, as well as some individual stories told by survivors.